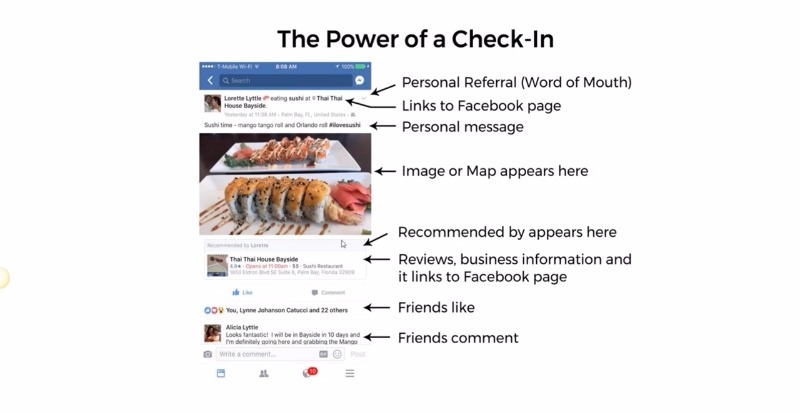 Facebook Check In is one of the best ways to get followers, engagement—-and business. When people check in on their Facebook page about your business, this spreads virtual word-of-mouth of your business to their Facebook friends. Most people have 300+ Facebook Friends on average they’ll be spreading word-of-mouth to! And they will also be more likely comment positively about your business while checking in—effectively recommending you to all their 300+ friends too! Facebook recently announced that they will be favouring person to person conversation in ones’ newsfeed. FB Check In helps this as it creates opportunities for this. When people comment about your business in their check in, it’s an opportunity to have a personal conversation with them. Respond professionally to their comments. They may respond in turn, which creates further opportunity to engage with them. Bonus if their Facebook friends see this and join in on the conversation as well, creating further engagement opportunities for you. For example, you can respond to to any complimentary check in comments like this: “Thanks for complimenting our special of the day. Glad you enjoyed it. Do you like product C? We’re having special on it next ___. Shall I save you one?”. This will likely generate a positive reply and future sales as their FB friends will see this as well. You can also use Facebook Check In to generate repeat business by encouraging people to repeatably check into your business. Let them know you reward people who reach a certain number of check ins with you. You can easily create a customer loyalty program from this by looking at your Facebook Business page notifications to track who has checked in the most with you. Place this tent at your point of sale for best results. Has instructions for anyone to easily FB Check In to your business. I offer a FREE generic Facebook Check In Table Tent that maximizes Facebook customer check ins to any business. Set what your special-of-the day is, prominently place the tent at your point of sale and encourage customers to check in your business on Facebook for your special. The tent comes with a disclaimer statement so that you can set any conditions to your daily special. It also comes with simple, step-by-step instructions on how to check in to your business on Facebook. 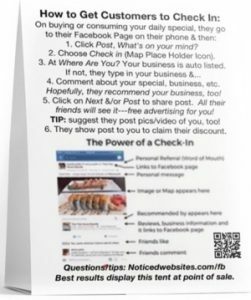 You can easily show your customers how to check in with these instructions even if you have never FB checked in before. Note: You should also honour your special regardless of what people comment about when checking in to your business on Facebook. To get this free table tent for your business, pay only $12 postage and handling to have it mailed anywhere in the world. Note the $12 is in US Dollars. The value of the tent’s Facebook Check In information is easily worth more than the $12 USD postage and handling and will pay for itself many times over in increased business. Order your tent by: 1) Choosing the percentage discount to be printed on your table tent for your daily special and 2) clicking on the Buy Now button below. After clicking on the Buy Now button, you can pay using your Paypal account or Pay just with your Credit or Visa Debit card. Please enter your mailing address, if it’s not already filled in during checkout, so that we know where to mail your tent to. 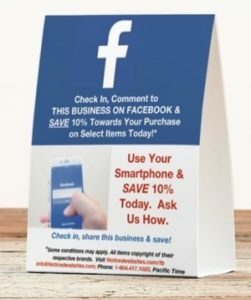 If you’d prefer a custom Facebook Check In Table Tent with your company branding, list a specific offer or free include (e.g. free appetizer), etc., please contact me and I can quote you the cost to customize a Facebook Check In Table for your business, depending on what you want customized. If you like more than one tent, let me know as well. Try out Facebook Check In today and let me know how it works for you. Have I overlooked a Facebook marketing tip that you’d like to share? You can try out these other Facebook marketing tips as well. You’re welcome to share your tips below under Leave a Reply. If you need any help implementing any of the above tips, I offer Facebook Marketing and Development Services, including setting up an online shop for your Facebook business page. Fill out the form immediately below and I will reply back with more information. Thank you for taking the time to read this post.